Hello guys, My last article was “How to build Facebook style Autocomplete using Angular JS, Cygnite PHP, Mysql and Bootstrap template” . Recently I received a request from one of my reader that “How to build Facebook style profile photo upload, creating thumbnail and save into server ?”. I will write the same here today. You might have notice in many social network site, in profile page when you mouseover in your photo "Update Picture" or "Upload Photo" displays. It's looks cool, as it is not displaying such old type of file upload html element. In this post I will not be able to cover whole tutorial. So I decided to divide the post into part. 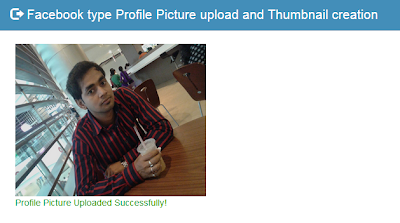 This tutorial will show you how to create "Facebook style profile photo upload using PHP, JQuery and Ajax." To build this app, I am using Cygnite PHP Framework, JQuery, Ajax, Bootstrap template etc. Using framework make my job easier (Since bootstrap theme, inbuilt libraries, MVC, Widget etc), well structured, also gives flexibility to maintain code. If you don't wish use entire framework you can also use Cygnite File Component to do the same. So the first step is to install Cygnite framework to build our application, I will not write "How to install Cygnite into local machine", as it is covered in my previous article. Below links for Installation of Cygnite Framework but Cygnite v1.2.4 doesn't include File Upload feature, so please update composer.json to download latest framework code (dev-master) or manually update the framework core. Let me consider you have already Cygnite installed into your machine. I have installed it into /www/cygnite/ directory. Now create a controller called ProfileController.php into your /cygnite/apps/controllers/ProfileController.php. We will render the default view page using indexAction. We are not using layout here, but you can also use layout to make your view page much modular, flexible. Paste below code into your controller to call your view page. When you create a new controller you also need to create a folder into views/ as same name as controller but lowercase inside /cygnite/apps/views/ directory. I am creating my view page called index.view.php inside /apps/views/profile/index.view.php and paste below code to render our profile default image. Create a js file called profile.js into cygnite/assets/js/profile.js and paste below code. Cygnite is shipped with bootstrap so you can use it or use cdn link. If you have already built an application and willing to use only standalone file component you can simply install Cygnite/File component using composer. I have installed composer globally in my system. Create a composer.json file into your root directory where you want to install component, paste below code and save it. Now open terminal/command prompt, change to your project directory where composer.json exists and issue below command to install File Upload Component to do the same stuff. I am creating index.php file to access Cygnite File component, and below code to access File Upload feature. Or you can also use Closure beautiful syntax as below. Now you can call the fileUpload function as usual in core php and calling this method in ajax url will process your ajax file upload. Don't forget to Include all above necessary css and jquery files in order to make the app work. Finally go to browser and call the application by issuing below url. We sincerely hope you found this article helpful. I will write “How to create thumbnail image / cropping to make image fit into profile area?” in my next post(part 2). If you would like to learn specific tutorial, you can also request tutorial or you are really interested to write tutorial for us please post me. Please don’t forget to like, share with friends, or leave your comments below. Keep visiting for upcoming posts. Have a nice day.